Two polemical treatises by Isaac Orobio de Castro. Collection of polemical treatises by Isaac Orobio de Castro, copied by Abraham Machorro, Amsterdam, 1705-1707.
p. V: Title: Epistola/ Invectiva Respuesta/ Sobre la Traducion,/ y Comento del Libro/ de Raymundo Lulio,/ por D. Alonço de Cepeda/ Por el/ Doct[o]r Ishac Orobio/ de Crasto./ Tomo Segundo. Skilled drawn frame with vignettes in aquatint representing biblical scenes, signed: “Guedelha lo escrivio ê Dibujo.” (Guedelha wrote and designed it). p. IX-XII : Table of contents. p. I: Title: Respuesta Apologetica/ Al Libro, que escrevió Don Alonço de/ Cepeda, e intituló, Defensa de los Terminos,/ y Doctrina de Raymundo Lulio./ Por el Doctor/ Ishac Orobio de Castro/ Cathedratico de Methaphisica, y Medicina/ en las Vniversidades de Alcalá y Sevilla./ Medico de Camara del Duque de Medina-celi,/ y de La Familia de Borgona del Rey/ Phelipe Quarto. Medico Professor,/ y Consejero del Rey de Francia, en la insigne/ Vniversidad de Tolosa. Año 1663./ Lo Copió/ Abraham Machorro/ En Amst.m Año 1707. Legend: “J: Guedelha Lo escrivio” (J. Guedelha wrote it). p. V-XII: Table of contents. p. 1-16: Respuesta/ Aun sujeto, que dudava, si el Libro de Raymundo Lulio, nuevamente traduzido, y comentado; era/ inteligible, y si concluían sus Discursos/ Por/ El Doctor Ishac Orobio de Castro, Cathedratico/ de Prima, de las Universidades, de Alcalá, y/ Tolosa &ª.
p. 175-190: Discurso sobre la Trinidad (Discourse on the Trinity). The manuscript is divided in two parts. Both title pages are work of Jacob Guedelha [Jacobus Gadelle, famous calligrapher who lived in Amsterdam around the year 1700]. The first part contains Epistola Invectiva contra la impiedad, de quien duda la verdad infalible de la Sagrada Escritura… It is identical with Epistola invectiva contra un Philosopho medico que dudava, o no creia la verdad de la divina escriptura… (see EH 48 A 12) and Epistola invectiva contra Prado… (see EH 48 C 12). This text was partly published by I. S. Revah in Spinoza et le Dr. Juan de Prado, Paris, Mouton, 1959, pp. 86-129. Epistola Invectiva was originally written in 1663. It is Orobio’s defence of rabbinic and Talmudic authority and of the validity of the Halakah, with arguments based on philosophical reason, against Juan de Prado’s writings. 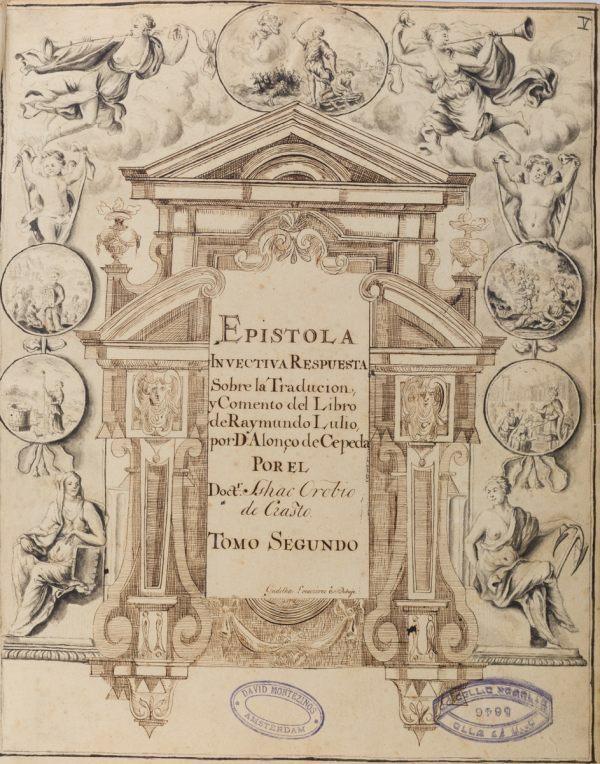 The title on p. V of the first part, Epistola Invectiva Respuesta sobre la Traduccion, y Comento del Libro de Raymundo Lulio, por D. Alonco de Cepeda… (Response against the translation and comment of Ramon Llull’s book by D. Alonso de Cepeda) refers to the second part of the manuscript. The second part contains three treatises. The first (Respuesta a un sujeto, que dudava, si el Libro de Raymundo Lulio, nuevamente traduzido, y comentado, era inteligible…) is a letter to Lorenzo Escudero, a Spanish actor and Jewish convert, who lived in Amsterdam. Escudero knew Don Alonso Zepeda in Brussels, who lent him a copy of his Spanish translation of Ramon Llull’s Arbor Scientiæ (Brussels, 1663) in the hope of persuading him to return to Christianity. Escudero told Zepeda that he knew someone in Amsterdam who would be able to controvert Lull’s arguments. This person was Oróbio de Castro and Respuesta a un sujeto is his response, in which he focuses in particular on Lull’s argumentation on the existence of the Trinity. The second treatise (Respuesta Apologetica al libro, que escrevió Don Alonço de Cepeda…) is an apologetic response to Alonso de Zepeda’s Defensa de los terminos y doctrina de S. Raymundo Lullio (Brussels, 1666). In this book, Zepeda accused Orobio of misunderstanding Lull’s ideas. Orobio replied with a clarification of his criticism of Arbor Scientiae and a response to Zepeda’s arguments. See other copies of these two treatises in EH 48 A 12. This manuscript also includes another treatise, Discurso sobre la Trinidad (Discourse against the Trinity). According to Yosef Kaplan, this discourse uses a more ferocious language than the other two treatises against Lull’s ideas. Whereas the other treatises were targeted at a Christian audience, Discurso sobre la Trinidad is Orobio’s attempt to clarify his position before the Jewish community. On the first fly-leaf a short list of errata in the same hand. Adam Sutcliffe, Judaism and Enlightenment, Cambridge, Cambridge University Press, 2003. Yosef Kaplan, From Christianity to Judaism: the story of Isaac Orobio de Castro, London, Littman Library of Jewish Civilization, 2004. Spanish, and Latin quotations / Paper / 28,7 x 22,6 cm. / 2 parts, I:  + 87, II:  + 190 pp. (last 3 ff. blank) / Variety of lines to a page / Skilled Iberian current writing / First title written in skilled drawn frame with vignettes in aquatint representing biblical scenes, signed ‘J. Guedelha lo escrivio y Dibujo.’, in part II each chapter starts with a drawn decorated initial / Catchwords at the end of each page / Contemporary gold-tooled leather binding. Fuks 238. Fundação Calouste Gulbenkian.